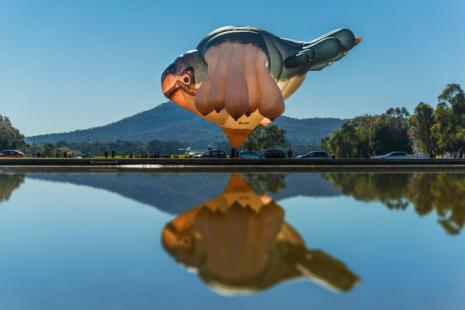 Australian artist Patricia Piccinini will join UC Santa Cruz professor emerita Donna Haraway for a conversation about their shared interest in what Haraway calls "technoculture and speculative fabulations" at 6 pm, May 5. Patricia Piccinini works in a variety of media, including painting, video, sound, installation, digital prints, and sculpture. In 2014 she was awarded the Artist Award by the Melbourne Art Foundation's Awards for the Visual Arts. She is well known for her invented, hybrid creatures which explore the end limits of evolution, both technological and biological. These creatures evoke the biotechnology and digital technologies that are challenging the boundaries of humanity. As Donna Haraway writes, "Piccinini is a compelling story teller in the radical experimental lineage of feminist science fiction. In a sf sense, Piccinini's objects are replete with narrative speculative fabulation. Her visual and sculptural art is about worlding; i.e., "naturaltechnical" worlds at stake, worlds needy for care and response, worlds full of unsettling but oddly familiar critters who turn out to be simultaneously near kin and alien colonists." Donna Haraway is a Distinguished Professor Emerita in the History of Consciousness and Feminist Studies Departments at UC Santa Cruz. She is a prominent scholar in the field of science and technology studies and the author of numerous books and essays that bring together questions of science and feminism, such as A Cyborg Manifesto: Science, Technology, and Socialist-Feminism in the Late Twentieth Century (1985) and Situated Knowledges: The Science Question in Feminism and the Privilege of Partial Perspective (1988). In September 2000, Haraway was awarded the highest honor given by the Society for Social Studies of Science, the J.D. Bernal Prize, for lifetime contributions to the field.